In some scenarios, it may be interesting to use a wildcard certificate to match different instances. First of all, it’s important to understand how they work. Everything is perfectly explained in RFC 6125. 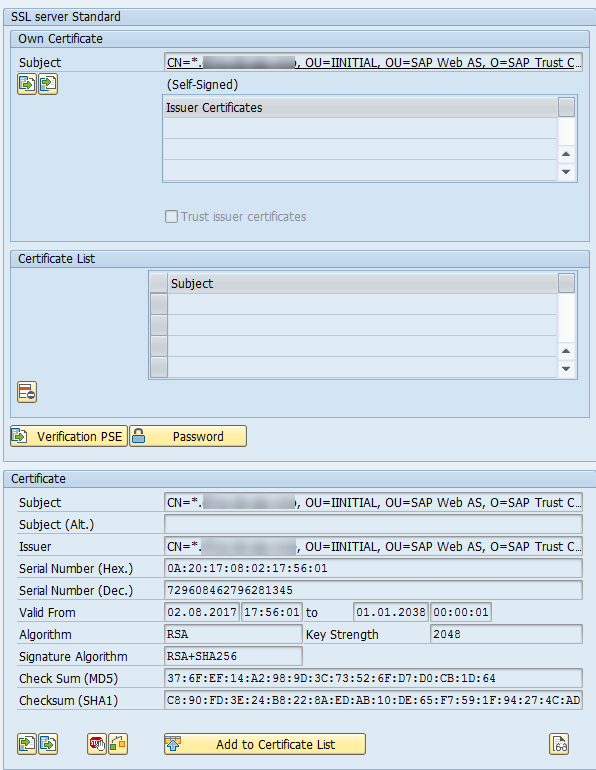 If you are unsure about PSE’s and certificates in the ABAP environment, check SAP Note 510007 and Expert Webinar 2445947. First of all, it’s necessary to create the ‘SSL Server Standard’, which is responsible for all incoming connections that the server may receive. A new window will appear, where you can define the ‘Name’ to be a wildcard value. Hit the confirm button and you will notice a green entry for each instance that you have in your system. Also, you can check that each instance has a specific certificate create to it. 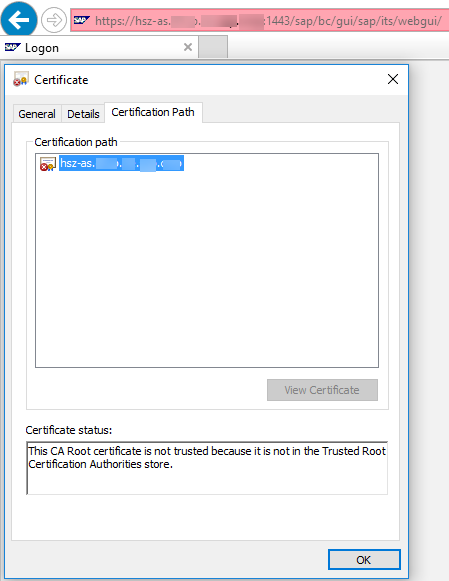 In my system, there is only one instance, and the certificate can be checked by double-clicking the instance specific button. Now, we can test the communication. Let’s use the ‘WEBGUI’ transaction to check whether the communication is secure or not. Not working. This is a common error and the solution is described in KBA 2339387. Basically, the web browser doesn’t trust in my server’s certificate, because it is self-signed and I did not imported it in the browser. To solve this issue, let’s sign the wildcard certificate. If you have any queries about it, you can check this blog post, which contains a guide explaining how to generate the Request and import the Response received by the Certificate Authority. Let’s test the WebGUI again. Wait, what? The same error happened. Let’s take a closer look at this error. If you click on ‘Continue to this website (not recommended)’ message, the login page of WebGUI will appear. 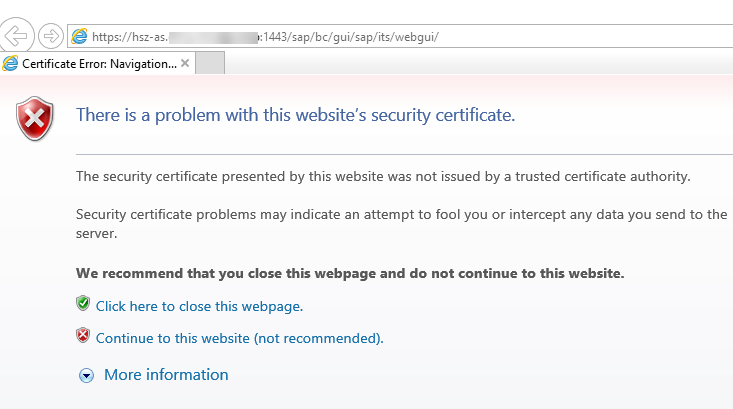 Then, we can click in ‘Certificate error’ (at the right end of the red address bar) to show up the certificate returned by the server. Well, this is not our wildcard certificate, but the instance specific. Actually, this is the expected behavior. The Application Server will always return the instance specific certificate. What we need to do now is to configure the Application Server to use the wildcard certificate instead of the instance specific. A new window will appear, showing the DN of each instance. 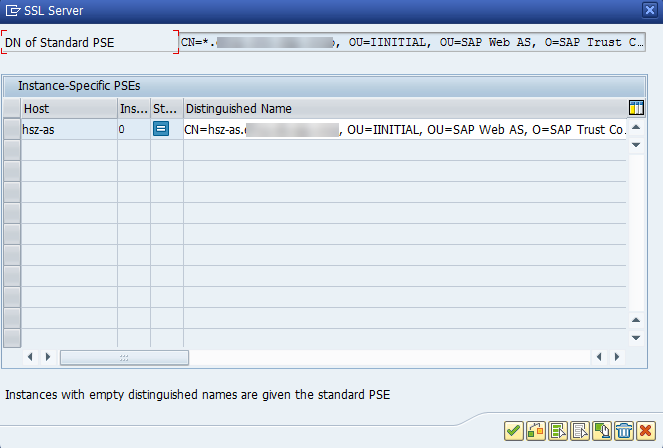 “Instances with empty distinguished names are given the standard PSE”. In fact, the process can be simplified when the PSE was created. 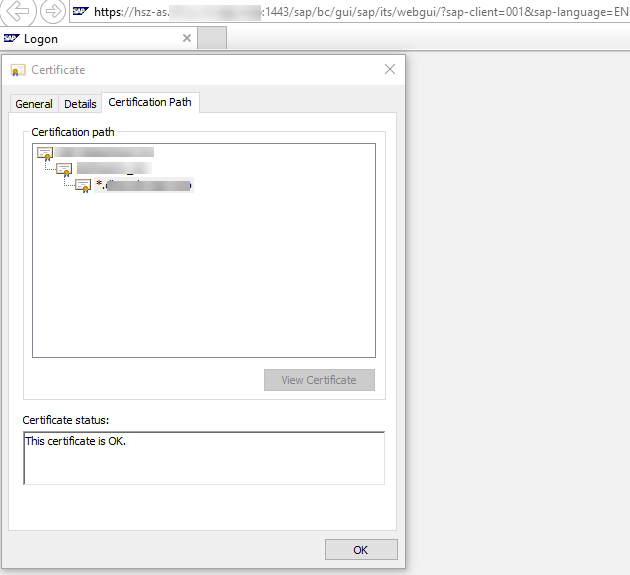 In the first creation wizard, it’s possible to already do this part of the configuration and do not create any instance specific entries, only the system wide one (which should be created with the wildcard certificate). To finish, just confirm the changes. Back in STRUST, hit the ‘Save’ button at the top. Depending on you NW release, it may be necessary to restart the ICM to the changes take effect. Usually, there is more than one instance that will use this certificate. 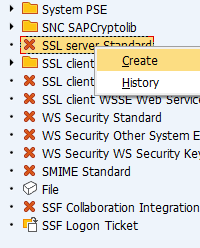 All you need to do is, in the ‘Change’ window, to configure the wildcard certificate to be used in that instance too. 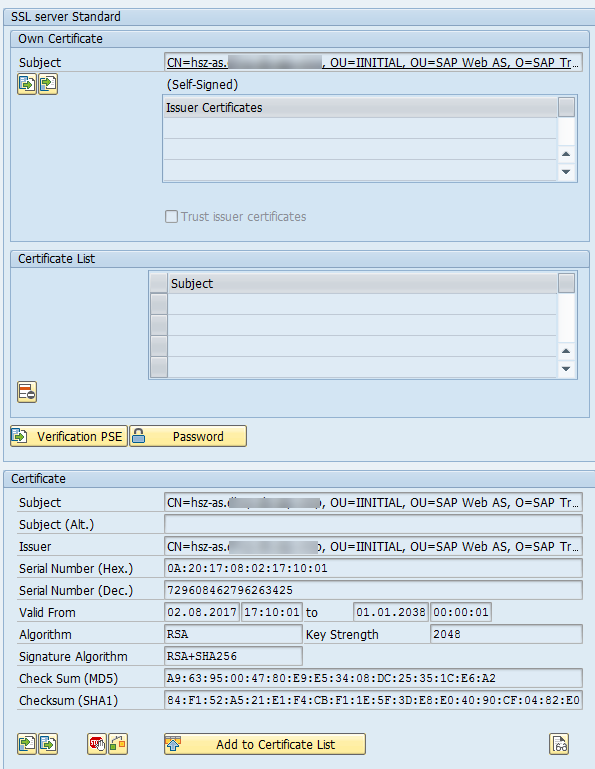 Hi, What version of SAP no longer requires a restart of icm after changing a certificate? We have outages every month because we have ssl certificates from vendors that expire monthly. If we don’t actually have to restart the ICM, that would be great. 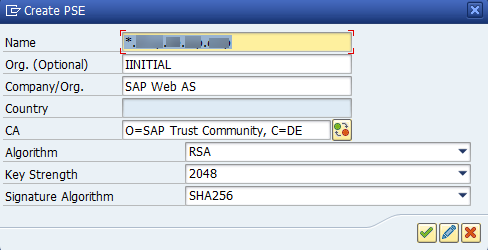 Beginning with SAP_BASIS 710 and 702 the icm should be notified. We do see a message that says “ICM has been notified” when saving in transaction smicm. Should we take that to mean that the icm doesn’t require a restart? Yes, but in STRUST tx, not SMICM. Oops – yes, I meant strust / strustsso2. Thank you! This will save us from a lot of unnecessary downtime.